Hello everyone! With Mother's Day right around the corner, I thought it would be fun to put a little project together for my kids to give to their Grandmas next month. I'm using elements from the Mother's Day Key Ingredients kit since it's already coordinated for me! You can click on any photo to see a larger version of it. Open the can with a safety can opener from the bottom. Pour out the contents and be sure to clean it out and dry it completely. 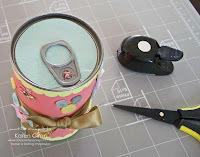 Cut your patterned paper or cardstock to fit the height and circumference of the pop-top can. 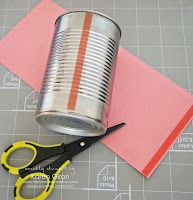 Add sticky strip to the can, top to bottom, and to the inside of your paper. 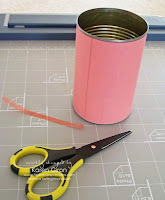 Peel the backing off the sticky strip on the can and apply the paper, then peel the backing off the sticky strip on the paper to create a smooth seam. 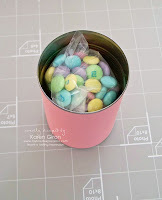 Fill the can with your goodies - I would recommend putting them in a baggie so the glue doesn't ooze all over the candy, or use individually wrapped candy. 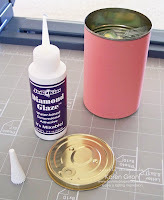 Use crystal effects or another strong glue and apply a steady strip of glue around the outside of the bottom you removed earlier. Press it back onto the can and be sure to hold it in place for a good 30 seconds. Now is the fun part! 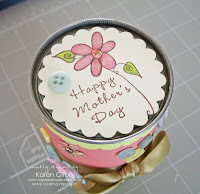 Add embellishements - I'm using silk flowers and ribbon from the Mother's Day Key Ingredients kit as well as Savannah buttons for mine. 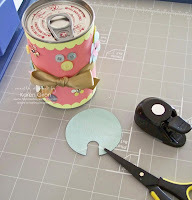 I also added strips of scalloped paper to the top and bottom of the can. To hide the "how to open this can" instructions (this makes me laugh! ), cut out a circle that is big enough to cover the wording. To get the paper to fit underneath the pop-tab, use a 1/2" circle punch and cut the paper to fit. Now you will be able to slide the paper right under the tab. 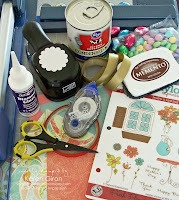 You can decorate the lid here or skip to the next step. This is an optional step if you choose to cover the tab. I stamped the sentiment and flower from Fresh Flowers onto my scalloped circle and used Copic markers. I added the button and some Flower Soft to the center of my flower. The scallop is popped up with dimensional tape. Now it's your turn to try - have fun with this! Don't miss out on all of our fun projects - sign up for the Taylored Expressions Newsletter. You can find the link on the Taylored Expressions homepage. Karen - this is sooo cute! LOVE your Mother's Day surprise! 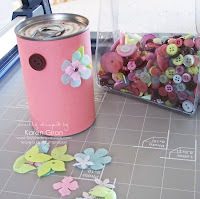 Love the buttons allaround the can and the flowers are awesome! Beautiful project Karen! Oh Karen, this is so cute! I have never done a pop top can....must try it soon! TFS your awesome project! What a wonderful and easy idea!!! Thanks for sharing!! this is so great, Karen! love your embellishment on the can. Great idea Karen! Very cute! LOVE this Karen!! I am totally going to make one of these!! Karen, this is such an awesome project! I just LOVE it! I can't wait to make one! This is adorable Karen!! 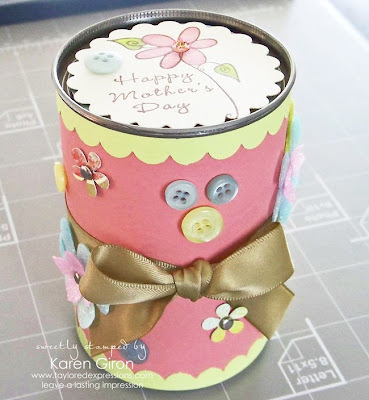 I LOVE it...and the can is decorated so nicely with all the flowers and buttons. Great job!! !